High quality sticky note pad in A7 size. Printed in the UK and available with fast turnover. This long-standing promotional favourite is manufactured in high quality white bond or pastel colour paper (50 sheets per pad). Razor sharp print in 1 to full print. We will beat any price on Sticky Notes. 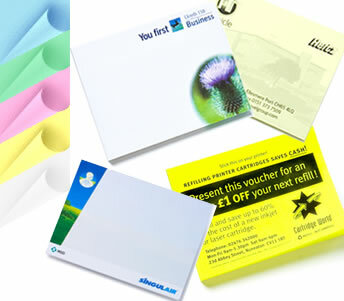 Prices include a single colour branding in 1 position and excludes origination unless stated. Please ring for plain stock prices. Origination charges from £35.00 per position / colour. All prices are subject to delivery and VAT.